. 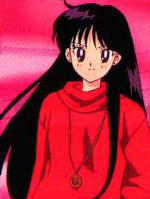 : Lunar Palace v.5 - Japanese: Sailor Mars :. Even though Rei and Usagi fight all the time, Rei cares for Usagi a lot. "When two people often argue, they're best friends." Rei's only friends before she met Usagi were the crows, Phobos and Deimos. Rin, Pyo, Tou, Sha, Kai, Jin, Restu, Zai, Zen. Akuryou taisan!